Treadmill injuries can be severe and dangerous. The belt rotates very fast, and one slip can cause severe injuries. Like anything in life, treadmill injuries can be prevented by being careful and reading the manual before use. A treadmill can be a great piece of equipment to have a healthy lifestyle. You can do a lot with a treadmill and use it as your all round fitness machine. With the growing awareness of fitness, a treadmill is one of the most sought after fitness machines of the times. This may also be because treadmills are considered the most natural way to workout. You may buy hefty machinery, but are unable to use them; however, with a treadmill you are basically walking, so this isn’t the case. It is easy to maintain, takes less space and anyone can use them. However, if you are new to treadmills or if you have kids in your house, you may need to take care of few things to ensure that there are no injuries because of the treadmill. These few steps will help you in making the use of a treadmill an injury free exercise. 1. If you have kids who insist on using a treadmill just because you are, never let them do so unsupervised. Do not give into tantrums as this can be disastrous. Only allow them to use it when an adult is present. Make a strict rule in your house and get them to obey it. Also, if you have very young children around, do not let them go near a treadmill. They may injure their hands or figures because of the belt. 2. Carefully read the instructions on the manual you get with your treadmill. That may be very helpful and save you the trouble of pressing a button you didn’t intend to. 3. You should never increase or decrease the speed of your treadmill fast. Go slow in this area, as your body will not be able to adjust to fast speed changes. 4. Switch off the power of your treadmill every time you stop your workout. This will minimize any accidents around it. One of the other causes of treadmill injuries is not warming up prior to the workout or stretching at least 5 to 10 minutes. Stretching helps warm up the body and prepare for the workout routine. 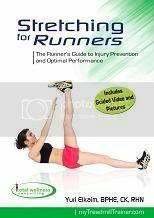 In the Stretching for Runners program, you will learn why static stretching before your runs can cause serious injuries and hinder your running speed and endurance. So, go ahead and enjoy a safe workout!